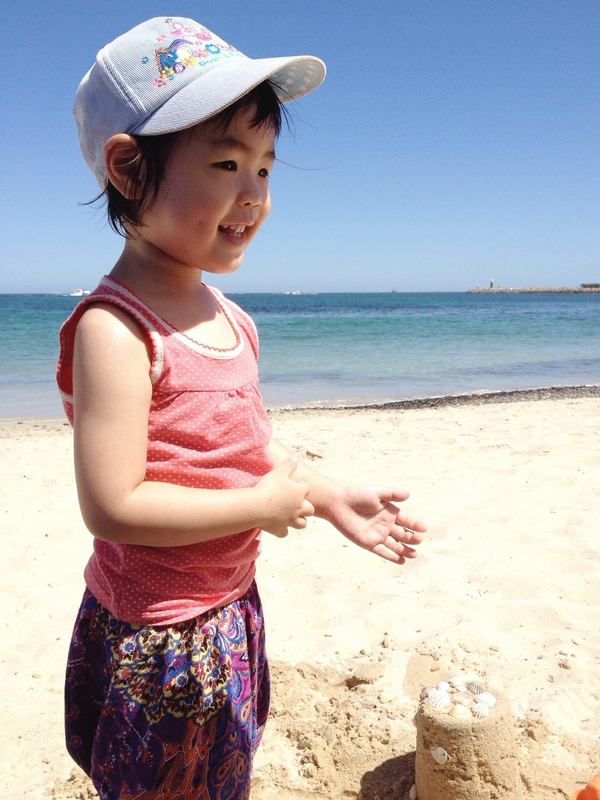 It has been a family laden fun weekend first starting with Fremantle beach on a Saturday with the kids. I think our Jurien Bay beach swimming got me hooked, that’s crazy for someone who fears the heat and hates summer. Then we had a ramen session with Jan and family at Nao in the city. Jan was surprised with the queue but luckily we were there fairly early and got seats easily. This was Andy’s salt based ramen with added char siew and pork oil. Only the pork oil was really little bits of pork fat which while tasty was kinda gross at the same time. Jan and I had the miso ramen with a side of mentaiko. Love mentaiko. 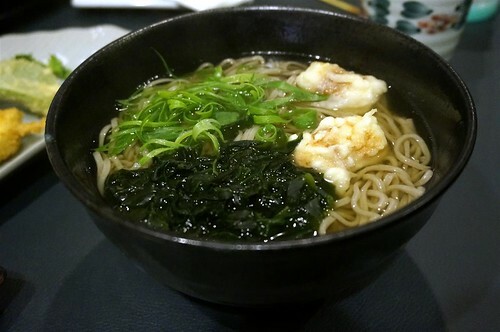 This was quite tasty but we were all very thirsty after our meal, too much msg in the ramen! 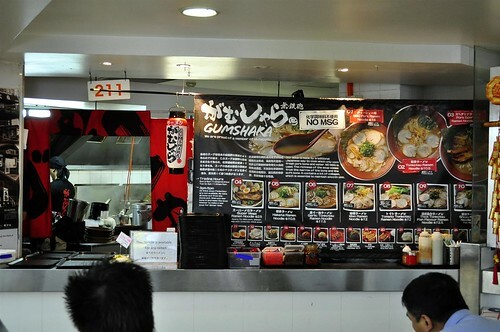 Ramen wise it was quite nice but R us still a steady fan of Sydney’s gumshara and I prefer ippudo too. 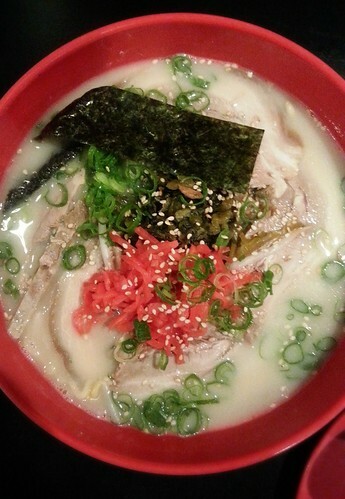 Andy says the new Hikaru has great tonkatsu ramen so we’re heading there next Sat haha. Lunch bento for Monday is beef lasagne. I’ve been trying to use the mobile to blog for a while to encourage frequent blogging but wordpress mobile just isn’t very handy. So I’m now on http://dayre.me/daitaoha ! It’s quite fun so far because my sisters are blogging from there. I will still be blogging from here because I don’t like the photo features on dayre and see it more as a daily personal blablabla blog. It might be time to close down this blog though. .. ah well, we’ll see. Have a good week! Headed into the city this weekend for some shopping. 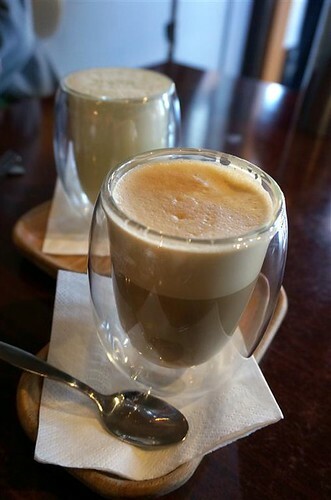 Tried the coffee @Moana (Hay Street mall) which shot coffee lover chills up my spine. Darn it, I thought I had downgraded my caffeine addiction due to the lack of good coffee in East Perth but Moana made me so sad that I’m not working in the city anymore. Moana is a quaint little cafe too, I will be returning. Pork Belly ramen from Zen (Subiaco) which we went eons ago because they were the one of two Japanese restaurants in Perth that served uni (sea urchin). Sadly they no longer serve uni and the restaurant was quite disappointing. R found his ramen pretty tasty but Andy thought it was similar to instant noodles (oops). 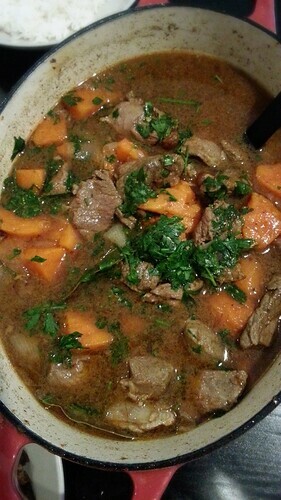 Another Gordon Ramsay recipe, Morrocan lamb with sweet potato and raisins. I am surprisingly finding Gordon Ramsay’s recipes quite easy to follow, I should have reduced the stock a lot more and it was a tad too salty, but I can imagine myself doing it again because one pot meals are so handy! 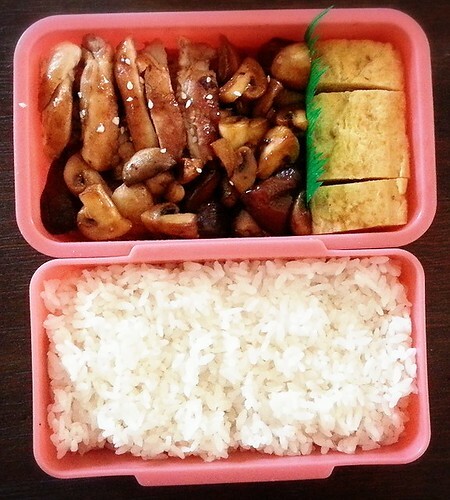 My foolproof teriyaki chicken and mushrooms with tamagoyaki lunch bento :). Hope the work week goes by quick! 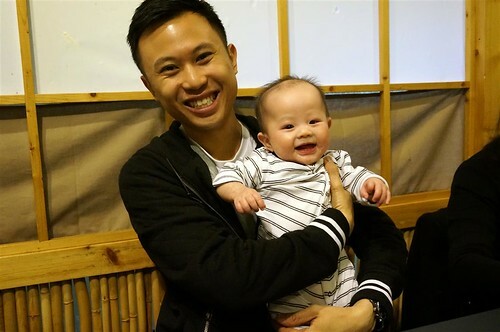 I’m afraid that my ah ma is right in saying I won’t be able to finish my Sydney posts before I’m in Singapore, so here goes another Sydney post! It was my second day wandering around Sydney city while R was attending his full day course. I remember a friend who once visited Melbourne on his own and told me he didn’t enjoy his trip as much because he felt lonely. In contrast, I didn’t feel lonely one bit and loved having breakfast and discovering the city on my own. I guess I’m a real introvert. Or maybe it was because I knew R and I would meet up at the end of the day so I could never be lonely for long (=^^=). 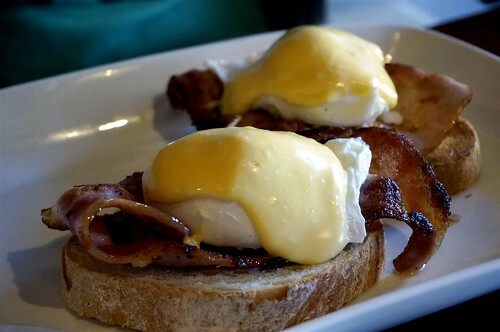 Early breakfast at Reuben Hills in Surry Hills, another must eat on my list. 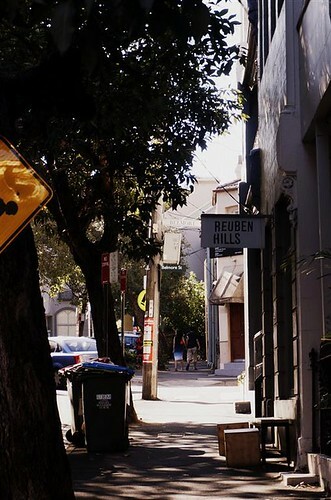 Again, Surry Hills was quiet and peaceful. The quiet streets were misleading though, I was surprised at the buzz and hive of activity when I stepped into the cafe. A classic Reuben sandwich which apparently originates from New York is a hot sandwich of corned beef, Swiss cheese with Russian dressing, and sauerkraut. 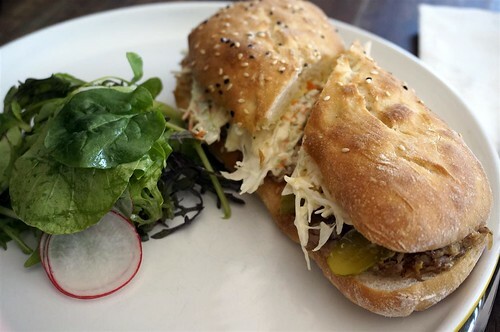 Reuben Hills had a fascinating menu of reubens and I found it difficult to make a decision. In the end I opted for The Broken Omelette Roll with fried shrimp and and bacon jam ($14). Interesting combination right? 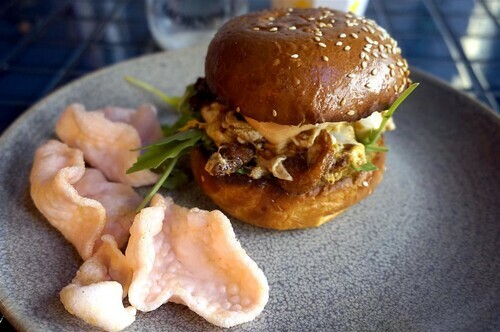 It came with prawn crackers on the side and really had teeny fried shrimp in the bun which gave it a crunchy texture. The bacon jam itself was tasty, but whilst interesting, I don’t think I would order this again. Instead of ordering their famous salted caramel shake, I had their lychee with lime and coconut shake which came out exactly how I imagined it would, refreshing and tropical. Would I return to Reuben Hills again? 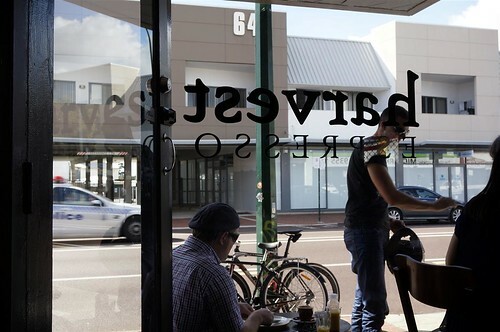 Definitely, only with so many great cafes in Surry Hills, it might be some time before I go back. After so much walking the day before, I ended my day a bit early and headed back to the hotel for a great afternoon of winter olympics watching. Sigh, I do miss the Olympics. Luckily World Cup is coming soon but there’s only one sport to watch, luckily I like football. We were contemplating whether we should return to Chinatown for Gumshara Ramen again (R really loved it) but I suggested we try another popular ramen store in the city instead. So Ichiban Boshi it was. 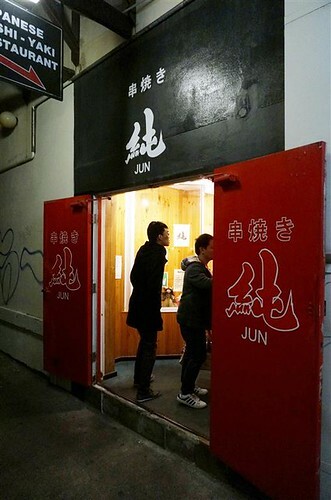 Located on the second floor of The Galleries shopping mall (opposite Kinokuniya), it’s pretty easy to get to this noodle store. Even though it was quite late by the time we arrived, the store was still quite busy. We wanted to order the Tonkatsu ramen which I read somewhere is their signature dish (with only 15 bowls on offer a day, that can’t be true?!). We weren’t surprised when the waitress told us that they had sold out on tonkatsu ramen for the day. 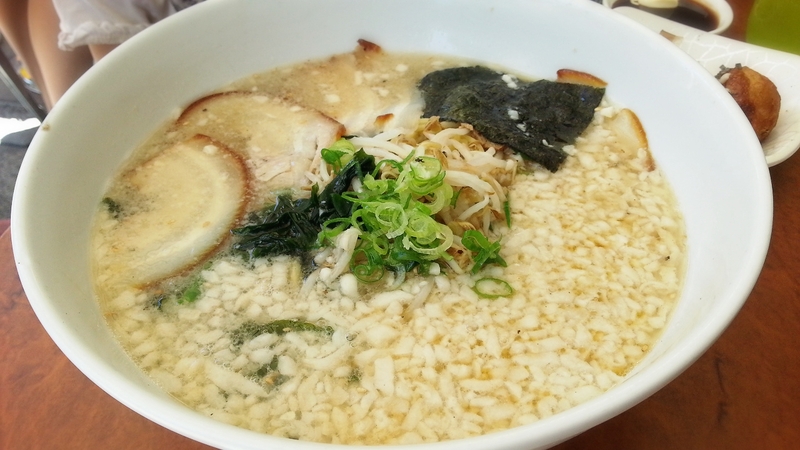 Oh well, R had the Miso Ramen ($9.90) instead. 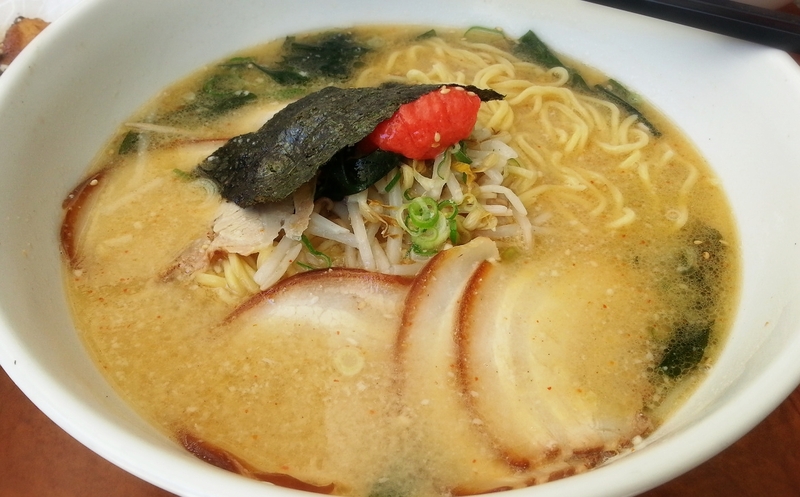 While it was no gumshara, he enjoyed this ramen and we agreed the ramen noodles themselves were very nice. I had the Tokyo Ramen ($9.90)which was a soy based ramen with char siew and a soft boiled egg. 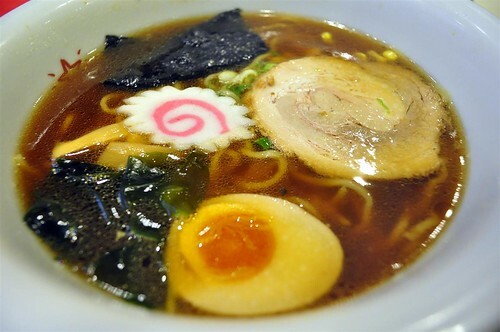 It was lightly flavoured and pretty good as far as ramen goes but I wouldn’t say that it’s outstanding. 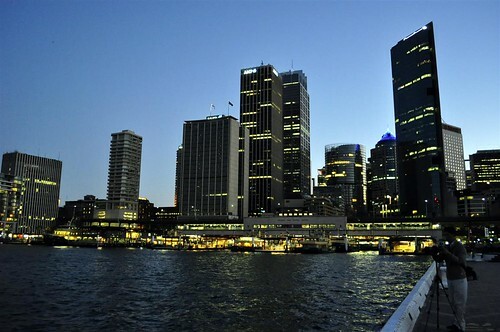 After dinner, we walked down to Darling Harbour to catch sight of the nighttime view of the CBD. It was very pretty. Maybe someday Perth will be like this once Elizabeth Quay is up, we can only hope. 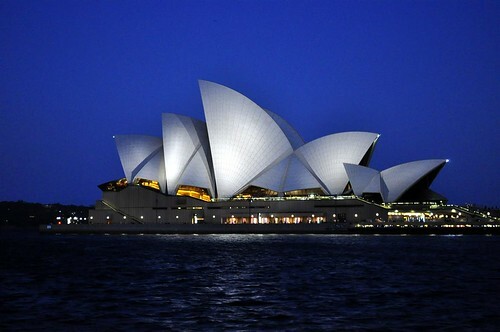 Can’t say you’ve been to Sydney without taking the obligatory photo of the Opera House! 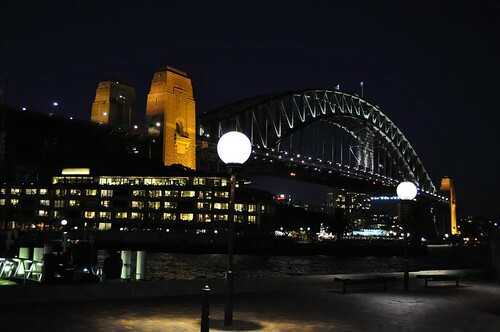 Sydney Harbour Bridge at night. It must be beautiful when the fireworks light up the bridge during New Year’s Eve. 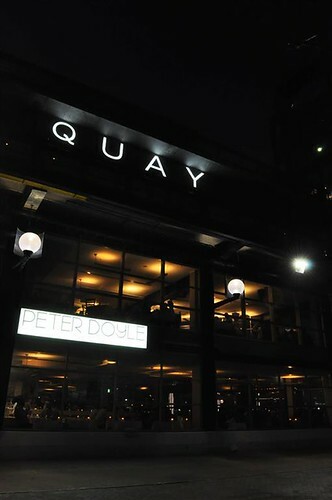 Quay with the legendary Peter Gilmore at its helm. He is the guy with all the beautiful creations that the Masterchef wannabes try to create to no avail. What a beautiful place to have dinner. R said we might go there for dinner some day 🙂 . 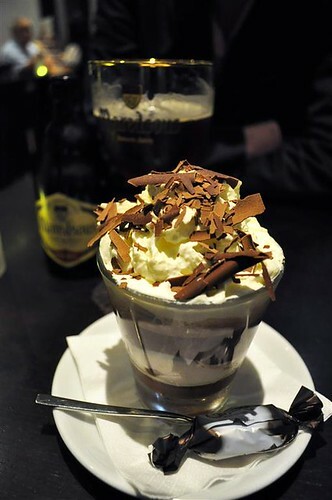 A short stroll into the Rocks for some chocolate dessert (R had a chocolate beer!) at the Guylian cafe (I can’t remember what this dessert was called but it was reaally good) and we called it a day. Another great day in Sydney. Just one final post on Sydney and I will have finished my Sydney series, it’s the best one too because we went to the Fish market *drool*. Let’s see whether I will get it done before we leave for Singapore. Four more days and my sister and family will arrive in Perth forever, woohoo. I’ve just returned from a lovely long weekend in Sydney. It’s been a while since I’ve visited Sydney and it was R’s first visit, I think it’s safe to say that we both enjoyed this trip a lot and are a little in love with the beautiful and fun city. Before I bombard this post with Sydney pics, here are some palmiers that I made for our workplace afternoon tea before I left for the long weekend. 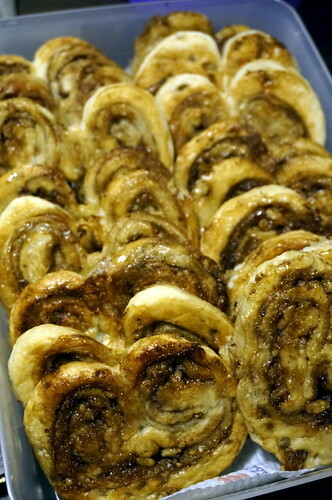 I used frozen puff pastry and a brown sugar, walnuts and cinnamon filling, it was a crowd pleaser at work (I work with a hungry bunch). 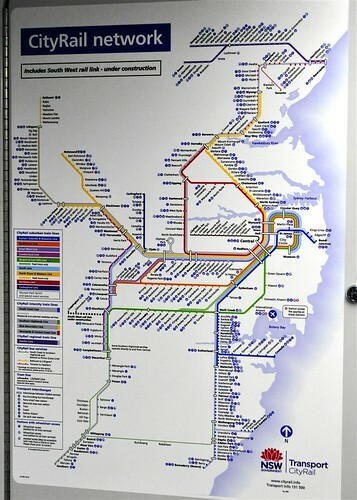 Back to Sydney, I loved their extensive city rail network which was easy to navigate. Not that it isn’t easy to navigate in Perth but we don’t have much choice here because our stations in comparison to Sydney’s are sparse and few! Funnily enough, our train line was closed for trackworks during the weekend so for a couple of days I traveled solely by free replacement buses which were well coordinated and frequent. R was really there for a professional development course while I tagged along for some foodie/shopping/coffee time. But the course didn’t start till Saturday so we still had the Friday free for some couple exploration time. 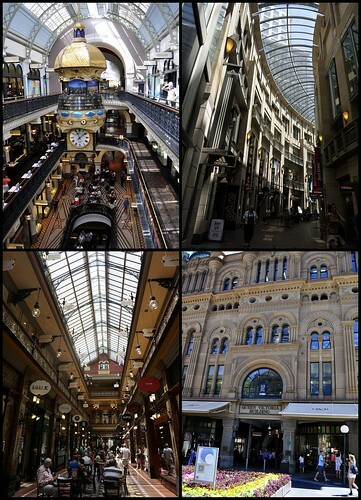 One of our first stops, the Queen Victoria Building right in town (TownHall train station). 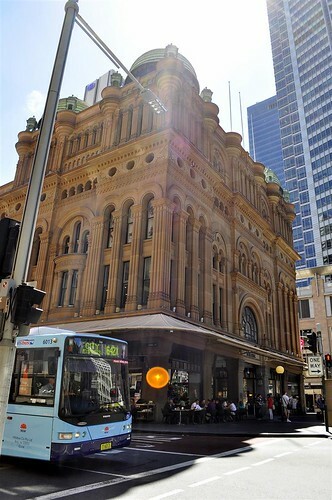 QVB is a gorgeous building of history which in recent times has been restored into its original design as a shopping mall. 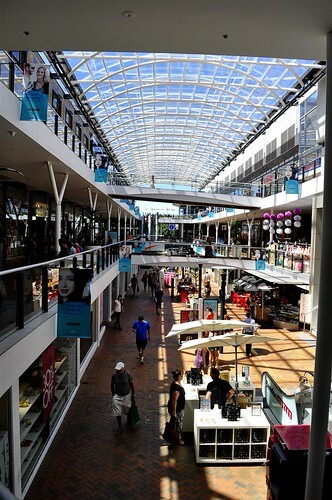 In fact, a lot of the shopping malls and lanes in the CBD are housed in picturesque old buildings. I’m glad to see that Perth is starting to embrace it’s heritage buildings as well and places such as The Terrace Hotel, The Trustee etc. are being put into good use and being enjoyed by the public. 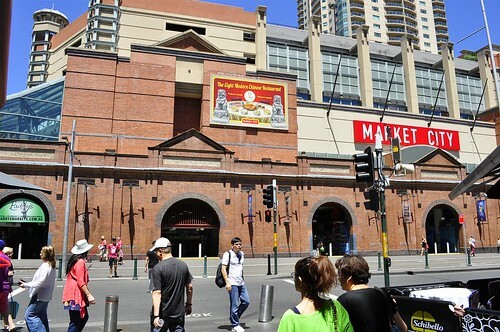 From QVB, we walked into the neighbouring Haymarket suburb where Chinatown (Dixon Street) is located. 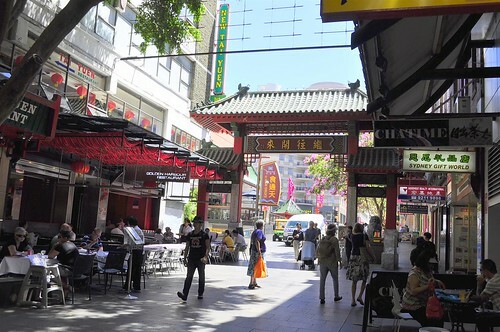 Chinatown was a lot smaller than I expected but I suspect that satellite Chinatowns have emerged in suburban Sydney and am determined to visit some during my next trip to Sydney. By this time it was getting close to noon and we were famished. 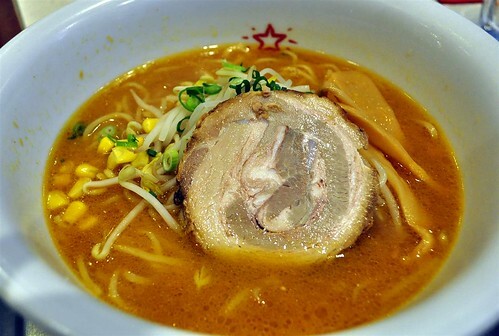 I didn’t have much time to do foodie research before my Sydney trip, but because R is a big ramen fan, I did google ‘best ramen in Sydney’ and came up with a few must-go ramen stalls with no.1 on the to-do ramen list being Gumshara Ramen of the 120kg pork bones per day tonkatsu ramen fame. 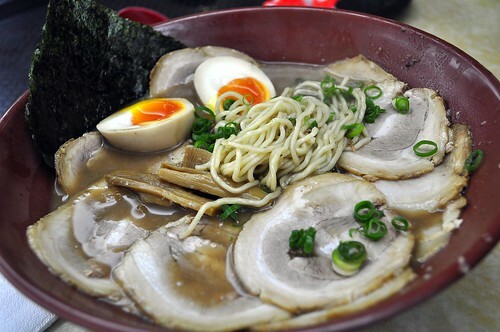 Ta-dah, the famous tonkatsu ramen with perfect soft boiled egg. The charsiew (bbq pork) slices were very tasty and well done, ramen were of a delightful ‘bite’ texture (not too hard) but it was really the thick, sinfully rich porkbone soup that hit the mark with R. He thought about it every day after this meal and has confirmed that he will visit Gumshara for his ramen hit every time he visits Sydney. In all honesty, the porkiness and heaviness of the soup was too much for me and I could barely manage half a bowl (this is why every girl needs a ‘finisher’), next time I will ask them to dilute the soup for me. By the time we staggered out from the food court, R was very very full. 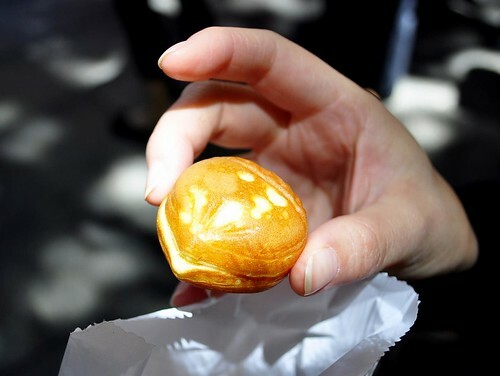 I however, still managed to have a few of the popular custard puffs from Emperor’s Garden bakery ($1 for 4). 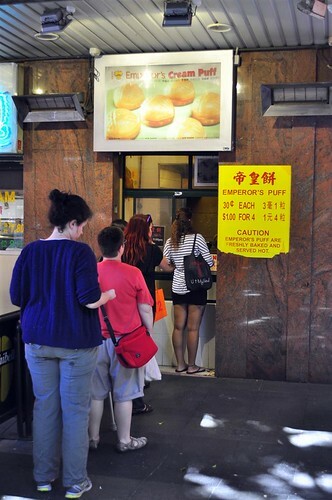 Even thought it was past lunchtime, there was still a short queue for the puffs, on another night when I visited Chinatown, I spied a tremendously long queue for the puffs. Are the puffs worth the queue? Not really. They are a great snack mind you, I love anything custard and these puffs were freshly made and still hot with creamy custard filling, I’m just not sure I would queue for so long to eat these puffs which were nice but not amazing. 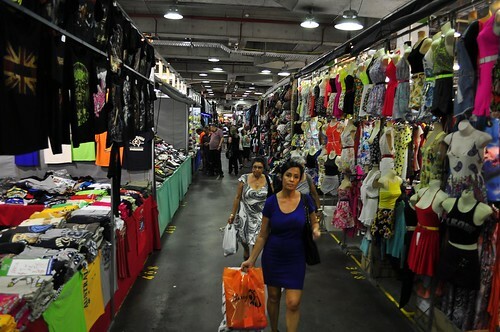 The bottom level of the building is the Paddy’s market which is a wide array of stalls selling everything from wigs, souvenirs, bags to clothes. The upper levels is the Market City shopping mall which is very Asian and makes you feel as if you’ve been transported to a local suburb shopping centre in Singapore. 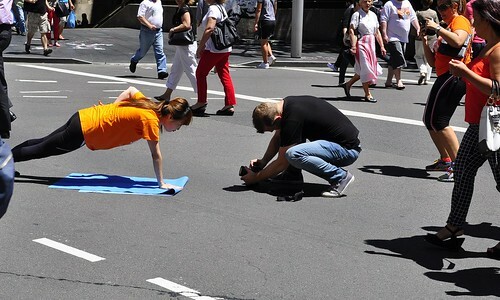 This young girl got quite a few stares when she started doing pushups (one hand too!) in the middle of the busy city streets. What was she doing? It was an Amazing Race challenge! Throughout the day we spotted Amazing Race participants racing around the city doing all sorts of different challenges, in fact, we were roped into one because one of their challenges was to take photos with random groups. Haha, so I might be on tv soon. 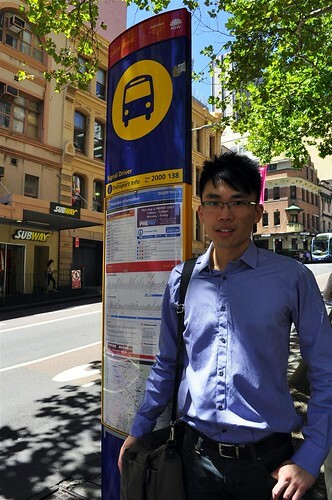 I told R that we had to take a picture of him in front of this bus stop to Birkenhead Point because we spent quite a bit of time trying to find the right bus to get to Birkenhead Point which is a factory outlet quite near the CBD but not easily accessible via the train. 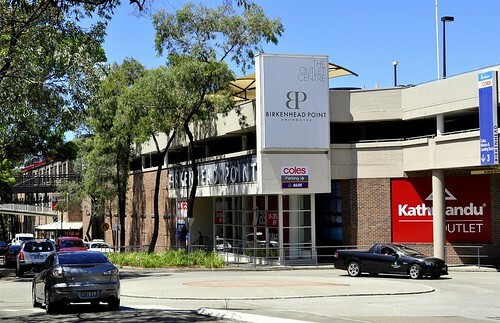 The bus stop is located on Druitt Street (near the Town Hall train station ) and you have to take the 500 series buses to Victoria Rd, Drummoyne, alighting at the first stop after Iron Cove Bridge. Follow the signs to the factory outlet which is a 2 minute walk away. It was a lovely area to shop at with the glittering harbour in near distance. Lots of great brands including my favourite Review, Cue Australian brands. Time for dinner! And it was a special one at Rockpool Bar and Grill which I had pre booked a couple of weeks earlier. 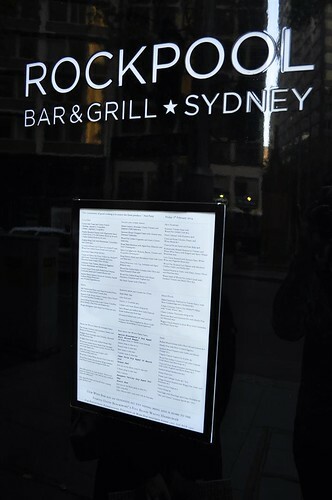 Rockpool is one of those famous restaurants in Australia that everyone raves about. 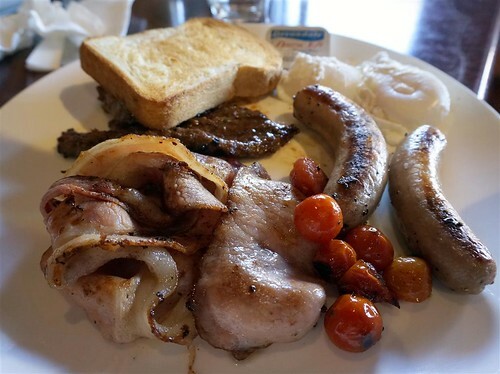 While some have commented that it’s overrated or not worth the hefty price, it has been very popular since it’s Perth branch opened up in Crowne casino. 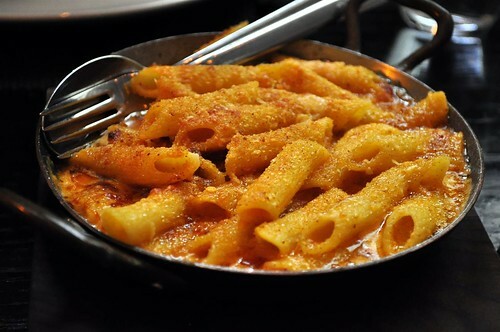 Many colleagues and friends have raved about the food but I’ve always been a bit skeptical. Despite the steaks being Rockpool Bar and Grill’s claim to fame, I was actually most impressed with the wide and lovely range of sides and starters offered by Rockpool. Everything sounded amazing and yummy so it was quite difficult to choose the steak tartare with chips ($25) as our shared started. 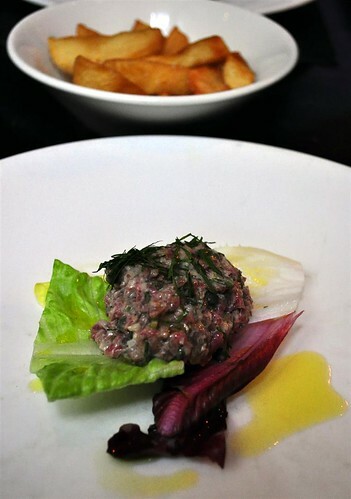 But it was a good choice because the steak tartare was very tasty, appetising and well seasoned. 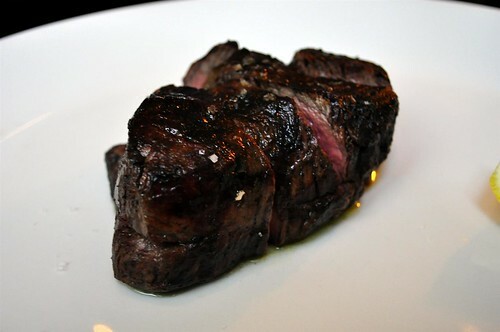 Friends have prewarned me that Rockpool’s famous steaks come with no condiments but is literally just one lone piece of meat .My Cape Grim grass fed 250 gm fillet ($55) was cooked a perfect medium rare and was definitely one of the better steaks that I’ve ever had. I’m not sure that it was a wow flowers coming out of head moment though. 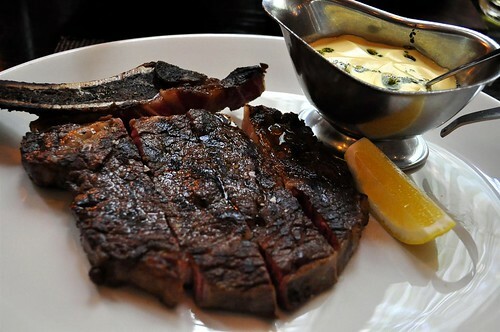 R’s 350g grass fed rib eye on the bone ($66) with bearnaise sauce. Also well cooked, R wasn’t too impressed with the cut of the meat and preferred my fillet finding it more tender. Our sides of ‘Mac and Cheese’ ($9) which is Rockpool’s decadent version of the simple mac and cheese and was rich and packed with flavour. 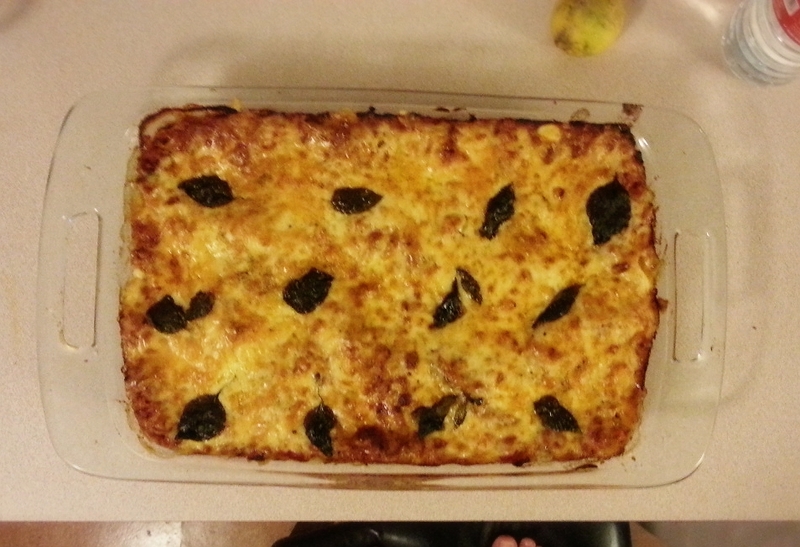 It was very tasty but again, I’m not sure whether it was worth all the accolades. Probably not something I would order again especially since there are so many other yummy sides to choose from. 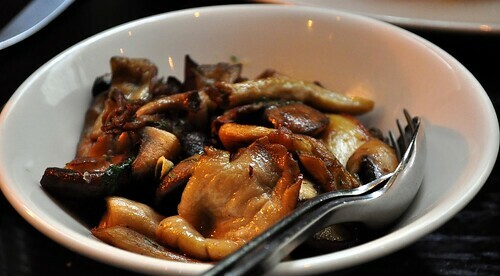 Sauteed mixed mushrooms ($25), such a simple dish but so delightful. We loves this side. The sides were all of a generous portion so I would suggest that small feeders should probably choose just one side to share between two. We had a nice dinner at Rockpool and it’s definitely worth a visit but probably doesn’t rate as high in terms of wow factor for me. Would I return again, I’m not sure, the other sides all sounded fantastic so I wouldn’t mind going just for the sides. But with so many other restaurants to try in Sydney, I think it will be a long time before I go back. All in all, a wonderful first day in Sydney. 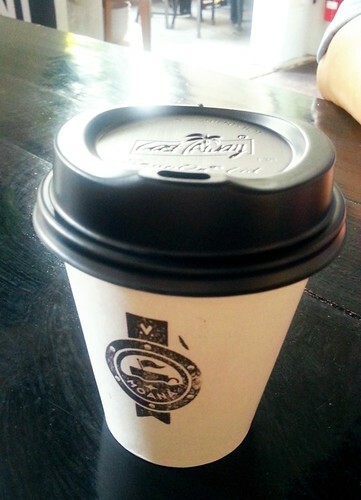 This time I introduced Jo and HC to Harvest Espresso which I’ve frequented a few times and enjoyed tremendously. As usual, the little cafe was buzzing but the nice and friendly waitress was able to get us a table pretty quick. 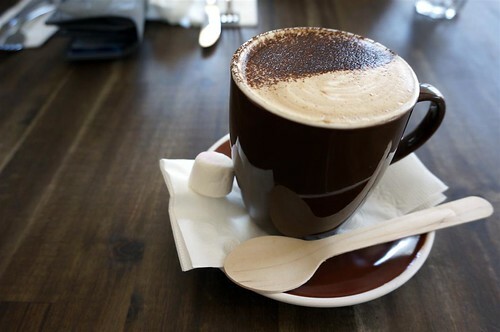 It’s always nice to start a weekend with a coffee. I tried to lie to myself that I wasn’t having a coffee by ordering a mocha. Trying to cut down on coffee is proving pretty difficult. Sometimes when I haven’t had a coffee at work, I find myself making a coffee (instant some more!) 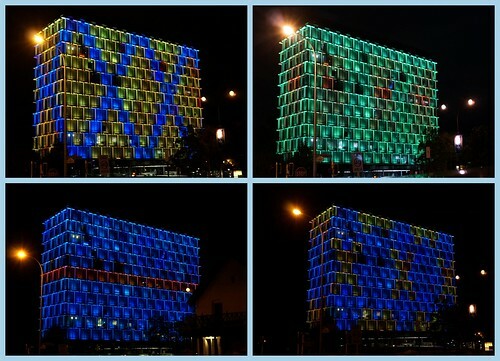 at night (^__^)”. My nervous stomach is obviously not getting any better. 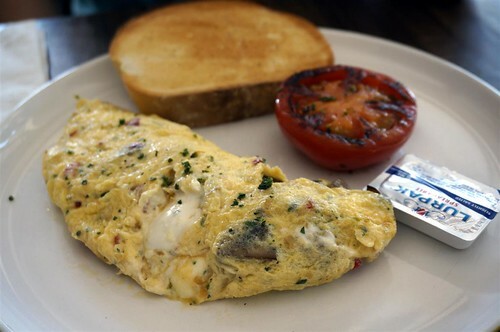 Jo had the mushroom omelette which she really loved, the omelette was creamy yet light, very tasty. HC’s pulled pork sandwich which they both said was very nice. He also had a side of sourdough toast with strawberry jam which he was lovely. 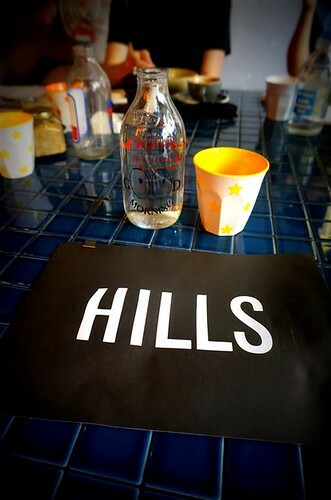 It was a nice brunch and I’m so glad that this little cafe is still doing really well, food wise and service wise. Eating in on Saturday night. 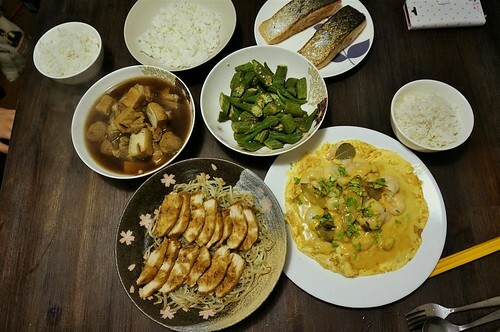 Sei soong yaat tong, four dishes and one soup, Cantonese style hehe. 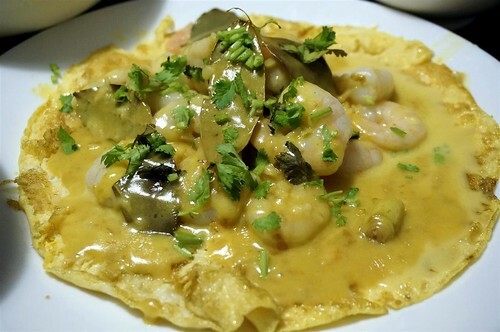 New dish, prawns in creamy butter garlic sauce on an omelette. 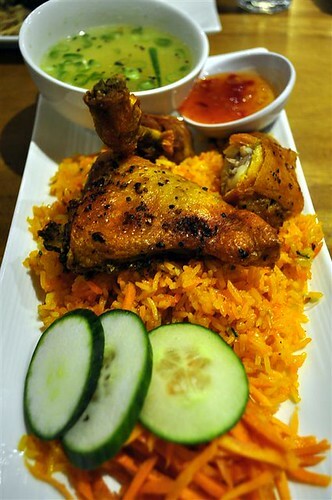 Very rich and sinful dish, I think it was just lacking a bit of chilli for a bit of oomph. 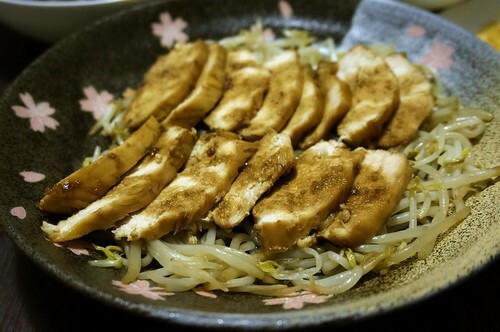 Chicken teriyaki slices with stir fried beansprouts. 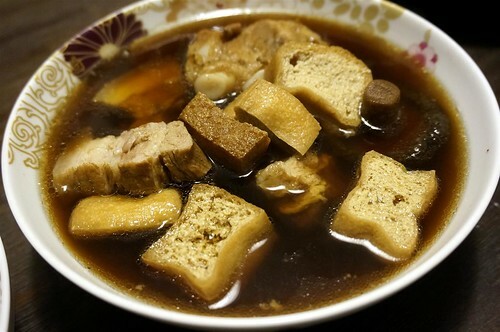 Our soup of the night was bak kut teh (pork rib soup) which I made with soft pork ribs and also belly pork. Also added tofu puffs and pork balls for a bit of variety. I took this picture for my mother because I wanted to let her know that we returned to Taka for Sunday lunch! 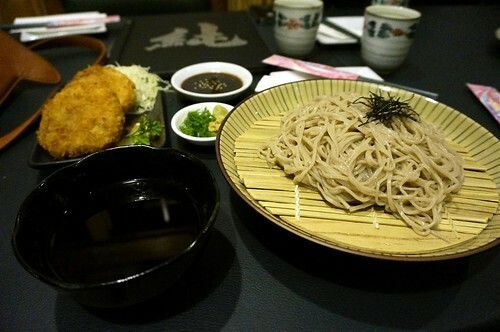 Ah ma remembers Taka fondly because it was the only Japanese place I brought her to eat back in the old days when I was a cheap uni student. 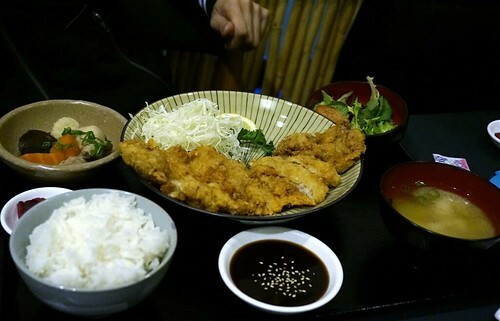 Taka is not so ‘cheap’ anymore, but it’s still very affordable and always tasty. 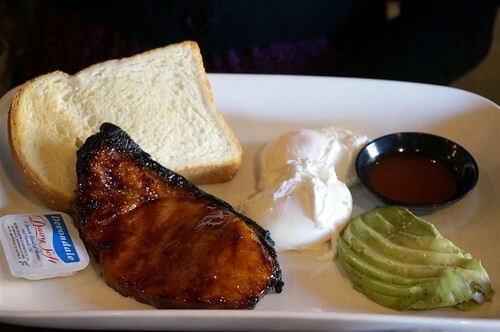 This is Jo’s teriyaki fish combo. 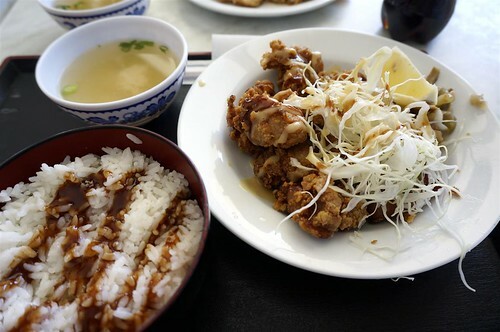 My chicken karaage combo which was very good. 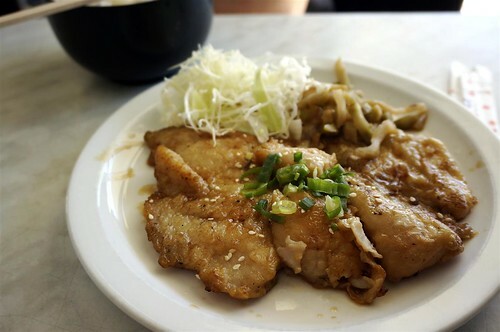 The chicken pieces were still piping hot while still tender and juicy. 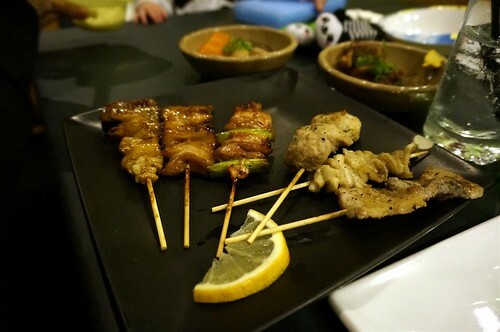 I reckon many high end Japanese restaurants around Perth wouldn’t be able to serve such a good chicken karaage. 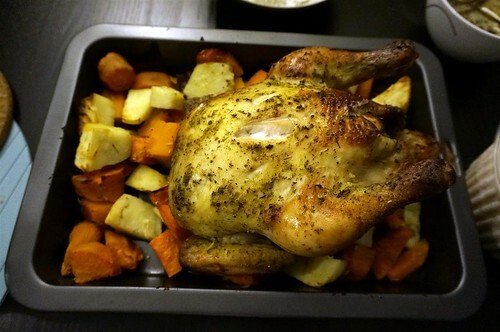 Sunday roasts seem to be have become the norm. This chicken was pre marinated and came with a cous cous stuffing, not sure about the stuffing but the chicken itself was nice. Next Saturday should be fun, we’re going to a fancy dress party! Maybe I should go as a big head prawn. It’s been a while since I’ve done any creative cooking in the kitchen :(. I’m no where near diminishing my 30 must-cook list, so far I’ve only cooked one out of the 30, but I promise I will do one more this week. 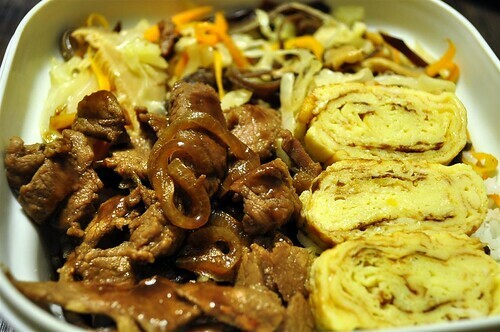 Instead, I have been relying on my old-time favourites, such as this teriyaki beef onion, tamagoyaki and stir fried cabbage and carrot bento. But at least I have been trying new food places! This is Tao Cafe, which while not actually new (they have branches in Myaree and Innaloo), is pretty new in Victoria Park. Already it is very popular and was buzzing on Saturday night. The upside of Tao? 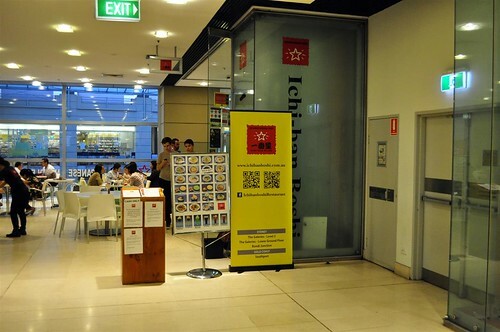 They have a wide variety on their menu ranging from Vietnamese, Thai to Japanese (they even have a sushi train). The downside? Jack of all trades, master of none. 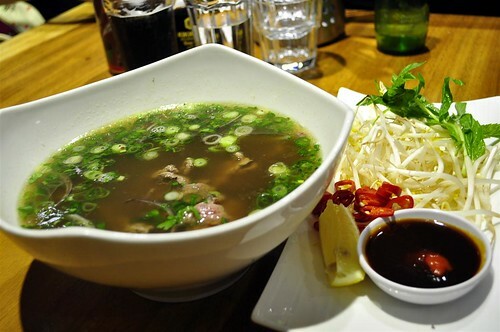 The Pho Tai above was very average, in fact, while the broth was alright, their noodles were not the usual smooth rice noodles that we’re used to from the Vietnamese fare in Northbridge. 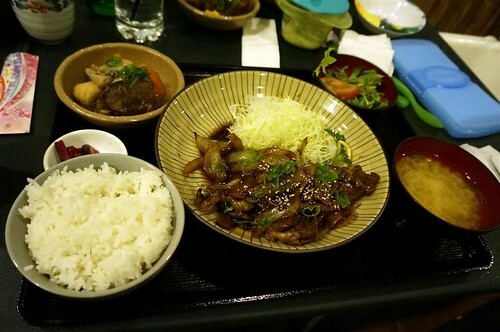 Prices also on the higher side (around $15.50 – 18.00 for a dish) compared to their counterparts in Northbridge. 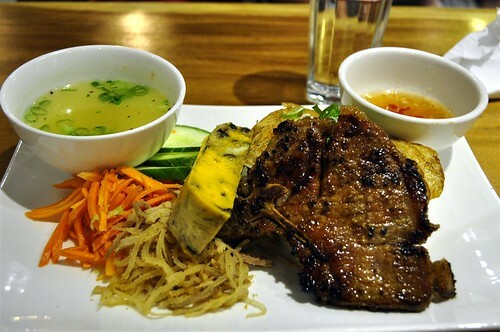 HC’s Com Tam ($15.00) broken rice with pork chop, egg and shredded meat. His first reaction was ‘very salty’ haha, so I guess that means it was pretty tasty. I have to say that the presentation of Tao’s dishes were all very appealing and nice, the orange hue of the rice of my Com Ga Chien Don ($15.50) a crispy chicken with rice and sweet and sour sauce, was very pretty. Unfortunately I’m not sure what they put in the rice to get that nice colour because the rice itself was rather bland and didn’t taste of anything much. It was much better after I mixed in the sweet and sour sauce which tasted like sweet chilli sauce. 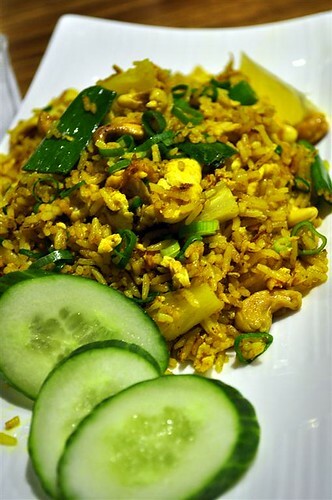 Jo enjoyed her Pineapple Fried Rice ($15.00) and said that she would return in the future. 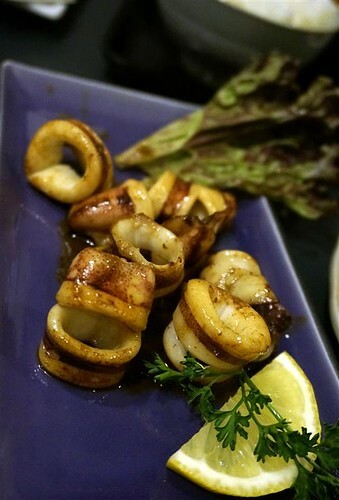 While the food was only average and portion perhaps on the smaller side, I can see why Tao Cafe is popular in the neighbourhood especially with its BYO policy, good location and bright cozy interior. I think it will be here to stay. All aboard! A different Sunday evening in Fremantle. 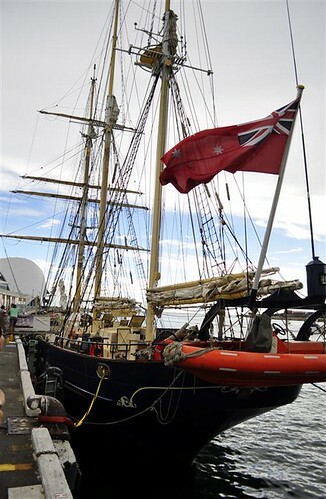 The guys accompanied me on a work function of a different kind (no, I am not a sailor) which saw us board the Leeuwin II. 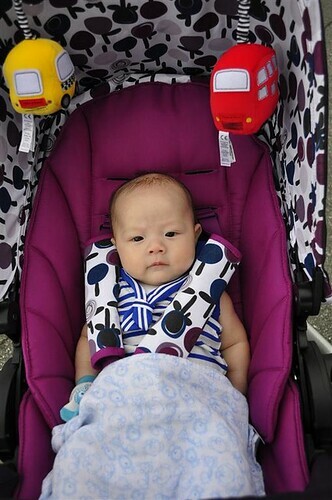 Baby was dressed up in his Sunday nautical best for the voyage haha. Lots of romantic stories regarding the Leeuwin. 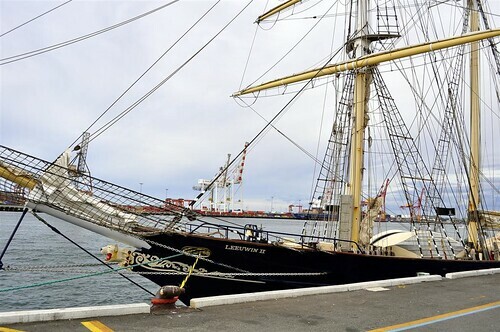 My colleague once proposed to her husband on board the Leeuwin II. 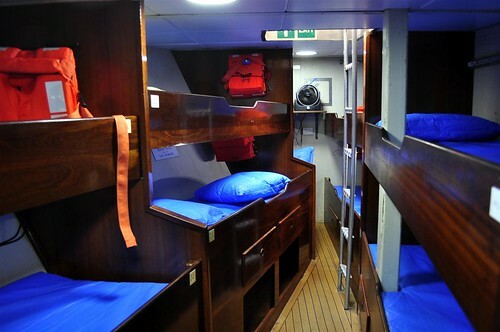 The tiny bunks down below. No individual cabins or captain quarters here. 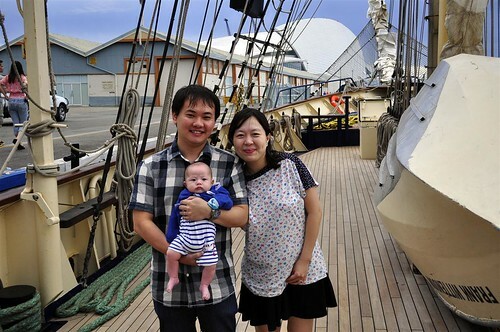 The whole family on the decks of Leeuwin II. I wish my parents were here, I think they would have enjoyed a tour around this little ship. Ah well, two more weeks till they arrive and we can go fishing in Freo. Bon voyage!